In a city of constant change and many faces, the name endures: Saigon. All at once, it speaks of the past, lives in the moment and heralds the future. To say Saigon is to speak of friendly generosity and thrilling dynamism; of youthful inhabitants honouring traditions yet embracing new ideas. TukTuk Thai Bistro stands at the beating heart of this Saigon. Diners join us to eat as they live: ready for new culinary experiences in a modern yet cozy space. And that’s what we deliver: stylish, delicious food evoking the finest flavours of Thailand. The story of TukTuk Thai Bistro began in 2014. Saigon was growing quickly, and, as always, welcoming diverse cultures and their unique culinary styles. Chief among them: Thai food. Its signature sweet, sour and chilli avours matched well with the Vietnamese pallet, and soon became a favourite of Saigoneers. Enter HT Group. With our passionate team experienced in ne dining, we quickly envisioned and made real a new Thai culinary space in the heart of Saigon. Thanks to our relationship with customers, we found early success. It has endured, making TukTuk Thai Bistro one of the foremost names for Thai food in Saigon. Just one year after we began, we were proud to open our second TukTuk Thai Bistro, in a prime city-centre location, in 2015. Today, we’re even stronger, and are ready for bigger dreams! 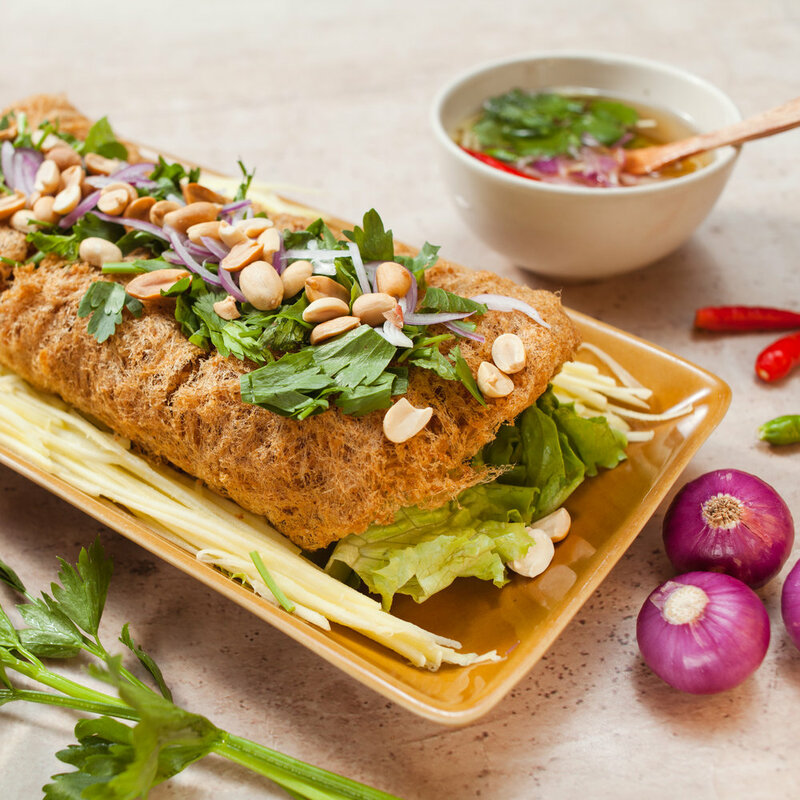 TukTuk Thai Bistro takes signature sweet, sour and chilli Thai flavours and tailors them to suit Vietnamese and Western pallets. Our restaurant spaces complement our unique culinary approach, with our bistro-style interiors generating an atmosphere be tting the dynamic, modern urban lifestyle. TukTuk Thai Bistro possesses a food & drink menu curated proudly with variety and creativity. We study and re ne traditional Thai recipes to present a menu worthy of Siam’s culinary legacy yet captures TukTuk Thai Bistro’s unique ambition. From the moment your food is presented, plated in our signature style, you will experience an adventure in taste: classic Thai avours fused with modern ideas and aesthetic sophistication. Each dish is our pleasure to make and our promise to keep: our recipes are continually tested and perfected, keeping standards high and quality consistent. We are equally committed to your well-being: TukTuk Thai Bistro commits to never using any arti cial ingredient. TukTuk Thai Bistro’s settings are chosen expertly: city centre locations beloved the young and stylish, and frequented by all wishing a glimpse into the modern Saigon lifestyle. Each TukTuk Thai Bistro plays host to a delicate bistro-style design, be tting the sophisticated tastes of our diners and the attentive service of our sta . Our venues embrace international ideas and art, and not only in our food: creativity and culture provide the inspiration for TukTuk Thai Bistro’s many weekend events.